In this edition of the suppressor review we test out the quiet and accurate Thunder Beast 22L-1 rimfire suppressor. The .22LR is one of the best calibers for suppression. With subsonic rounds it sounds like a quiet pellet rifle, which makes it the ultimate combination for pest control. The Thunder Beast Arms 22L-1 rimfire suppressor is a top-of-the-line choice for .22LR suppression, too. The 22L-1 suppressor is constructed from 100-percent titanium, which makes it extremely light and strong. It’s also rated for .22LR, .17HMR and .22WMR. Since squirrel hunting and pest control are my main objectives when using my Ruger 10/22, I depend on accuracy. I need bullets touching at 50 yards and the 22L-1 has no problem achieving this. Thunder Beast is known for making accurate suppressors. The owners of the company are competitive long-range shooters and they started building suppressors because they were frustrated with the accuracy capabilities of suppressors on the market. Thunder Beast claims point-of-impact repeatability and I found it to be true with the 22L-1. I took it off my Ruger, attached it to a new Smith & Wesson Victory pistol and then put it back on the Ruger and it held zero. 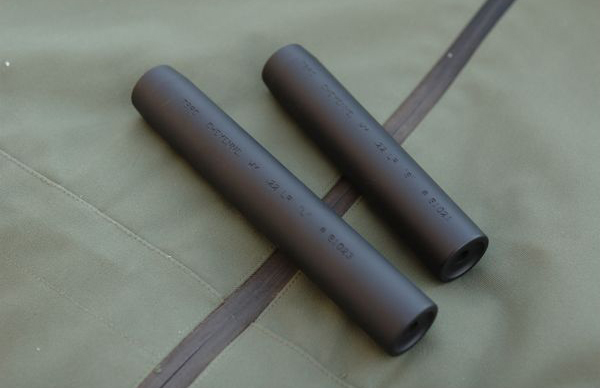 Not only does the suppressor perform great, but when paired with a thicker barrel its almost a seamless transition, which really looks good on the end of a rifle or pistol. The 22L-1 sells for $510 and is a great investment for shooters looking for a rock-solid build, lightweight and accuracy in a suppressor. Thunder Beast now makes a Model 22 Take Down suppressor for .22LR, .22WMR, .17HMR and 5.7x28. The Model 22 can be disassembled and cleaned. Silencer Shop sells the Model 22 for $395.